If you’re like most people, you hear the word upholstery and you automatically think of the interior space of your car or truck. “Oh, I’ve got to clean the upholstery,” comes to mind every couple of months, whether you actually do it or not. What is upholstery, anyway? It’s defined as the work of providing furniture (especially seats) with padding, springs, webbing, and fabric or leather covers. The word actually comes from the Middle English word “upholder,” which used to refer to a tradesman who held up his goods. First, you want to maintain the overall nice and fresh look of your furniture, right? 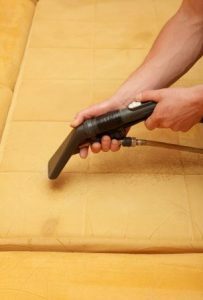 Cleaning its upholstery every couple months helps prevent dirt and grime from building up and taking over each piece. Ever have a stain that won’t seem to come out, no matter what you try? Chances are you’ve let the stain linger for years and it’s seemingly “ingrained” in there. Not good! Next, think about your own health and the health of people who use your furniture. You should want your upholstery to be clean rather than dirty– that way it won’t smell bad and bacteria won’t start growing where you don’t want it to grow. To prevent mold from growing, and to keep pests like fleas away from your couch, recliner, bed, etc., you need to make sure your upholstery is cleaned regularly. Finally, consider the air quality in your home or place of business. Upholstery that’s not cleaned can end up causing the air quality in rooms to be poor and even unhealthy. If you think you might have a build-up of mold, mildew, dust and/or allergens, it could be your dirty upholstery. Long story short is this: bad air quality equals breathing problems. Since furniture is typically expensive and you want it to last a long time, you should hire Horizon Carpet, Upholstery, Tile & Grout Cleaners of Phoenix to come and clean your upholstery. For Phoenix & East Valley, call 602-404-8064 and for Phoenix & West Valley, call 623-561-6277.